The Centro di Educazione alla sostenibilità (CEAS) (*) Emilia Occidentale is in charge of the Environmental Education for Sustainability in the five Parks and four Reserves in the Provinces of Parma and Piacenza: Parco dei Cento Laghi (PR), Parco Boschi di Carrega (PR), Parco dello Stirone e del Piacenziano (PR e PC), Parco Fluviale del Taro (PR), Parco Fluviale del Trebbia (PC), Riserva dei Ghirardi (PR), Riserva Monte Prinzera (PR), Riserva Parma Morta (PR), Riserva di Torrile e Trecasali (PR). Starting from this year, the CEAS manages the Parco provinciale del Monte Fuso (PR) as well. The CEAS belongs to the Regional System for Sustainability Education. Many themes are proposed: from the discovery of the forest's and river's ecological fauna to geology and paleontology, through the research of the micro-invertebrates, the birdwatching and the cohabitation of man and animals. 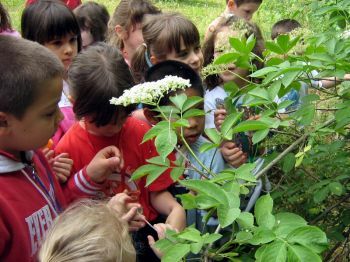 The educational offer includes proposals for all the schools: as far as the nursery school is concerned, the themes are mainly focused on the emotional and playful approach, whereas in the primary school more complex paths are proposed to make children understand the natural world and the connection between human beings and nature. The secondary school will find deeper analyses of specific themes, even interesting sparks regarding the environmental sustainability. The educational activities address any school, but they are particularly suitable for the schools of the compulsory education period and for the nursery schools. Priority proposals: educational activities regarding the themes of "Biodiversità" (Biodiversity), "Parco come Bene Comune" (Park as a Common Good), "Acqua e Territorio" (Water and Territory) and "Convivenza Uomo-Animali" (Cohabitation man-animal), in collaboration with our operators. Such activities are free for the schools within the Parks' municipalities (**), until the available budget lasts. The proposal "Convivenza Uomo-Animali" is connected with the contest entitled "Al lupo al lupo!" addressing the schools. Special projects: educational paths resulting from co-planning activities with teachers on the priority themes proposed by the Park Authority; activities at reduced price for the schools belonging to the Parks' and Reserves' municipalities (**). Standard proposals: environmental education activities, often linked with the territories. Full price. For the secondary schools the activities need to be planned in collaboration with the teachers. (*) Belonging to the CEAS: Borgo della Pulce Center in Parco del Taro, Museo dei Boschi and Vivaio forestale "Scodogna" in Parco Boschi di Carrega; The Visitor Center and the Nature Museum, the Center for the Recovery of the wild animals "Le Civette" in the Parco dello Stirone e Piacenziano; the "Museo all'aperto Madoi" in the Parco dei Cento Laghi. (**) THe Municipalities in the Parks and in the Nature Reserves: Albareto, Alseno, Borgotaro, Calendasco, Carpaneto Piacentino, Castell'Arquato, Collecchio, Corniglio, Fidenza, Fornovo Taro, Gazzola, Gossolengo, Gragnano Trebbiense, Gropparello, Lugagnano Val d'Arda, Medesano, Mezzani, Monchio delle Corti, Neviano Arduini, Noceto, Parma, Pellegrino Parmense, Piacenza, Rivergaro, Rottofreno, Sala Baganza, Salsomaggiore Terme, Sissa-Trecasali, Sorbolo, Terenzo, Tizzano Val Parma, Torrile, Vernasca.